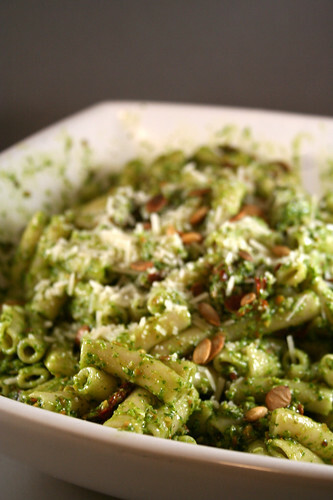 Since pesto can really be made with any type of nut, I figured making a pumpkin seed pesto would work great, too. I had also grabbed a huge bunch of arugula at the farmers market and I know I had seen pesto made with arugula instead of basil before, so I figured I would give this combination a try. It was so incredible. The spicy peppery flavor from the arugula was perfection and the toasted nutty flavor from the pumpkin seeds complimented the arugula so nicely. It was such a robust combination of so many great flavors. I personally love a garlicky pesto, I love that spicy kick! However, if you aren’t a fan of the raw garlic taste, either cut back and only use one clove, or consider roasting the garlic first. I happened to have both Parmesan Reggiano and Pecorino Romano cheeses on hand, so I went with a mix of the two. Feel free to just use one or the other. This pesto is very versatile and it would be great spread on a sandwich, or served over vegetables, chicken or fish. I didn’t use the entire batch of pesto, so I put the leftovers in an air-tight container and in the fridge, to use in the next day or two. You can also freeze pesto in small batches and thaw to use, as needed. Toast pumpkin seeds in a single layer of a cookie sheet, at 400º until they are toasted on all sides, stir occasionally, about 5-10 minutes. Remove and allow to cool. Reserve 1/4 cup of the toasted pumpkin seeds for serving. In the blender mix arugula, olive oil, garlic and cheeses until everything is well blended. Add pumpkin seeds and pulse into the mix until minced. Salt and pepper to taste. 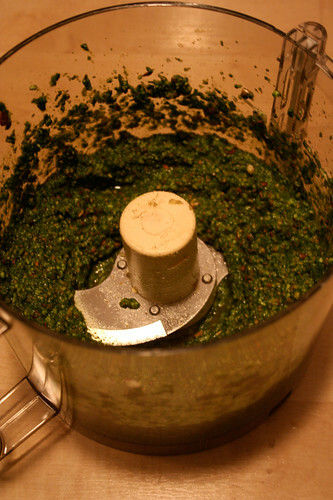 Add more olive oil if you like your pesto more drizzly and thin, less if you like it drier and thicker. Cook your pasta according to package directions, reserving 1/4 cup of the cooking liquid. Drain and rinse your pasta. 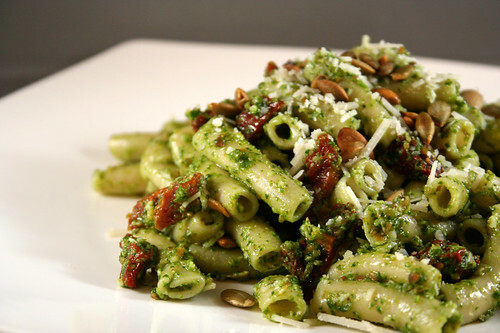 Place the pasta in a large serving bowl, add the sun-dried tomatoes and pesto. Toss to combine, making sure all the pasta is coated with pesto, adding in the pasta cooking liquid as need to thin the sauce. Salt and pepper to taste. Serve the pasta to each plate, sprinkle toasted pumpkin seeds and Parmesan Reggiano cheese over the top. This past weekend, I had to make sure to make a trip to the Elmwood Bidwell Farmers Market, since it was the second to last weekend that it is going to be there. I stocked up on pumpkins and squashes, brussel sprouts, arugula, sage, leeks, potatoes and so much more. 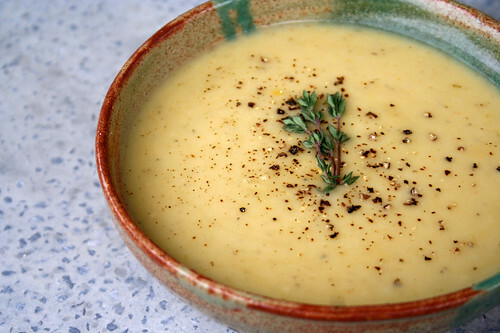 I couldn’t wait to get home and make a huge pot of this creamy potato leek soup. I was happy to find I had everything I needed for this soup already in the pantry, so I could just throw it together quick and enjoy my Saturday evening at home, cuddling with hubby and puppy. I decided to skip any type of cream or milk and go with vegetable broth to keep this soup vegan. I am telling you, on first taste, you could swear there was some type of dairy in there, Mark couldn’t believe it. It is so creamy. If you’d like to go with a chicken stock instead, feel free and if you want the ultimate in creaminess, add a splash or two of heavy cream or milk. I honestly suggest making this soup without the dairy first, you’ll be pleasantly surprised by how creamy it is without it and no reason to add the extra calories and fat. If you really want to be indulgent, top your soup with some crumbled bacon (only if it’s farm fresh pastured-raised, humanely treated bacon, of course). In a large pot, heat the olive oil over a medium heat. Add the leek slices and season with salt and pepper. Cook leeks over a medium-low heat for approximately 10 minutes. Stir often, making sure they don’t brown. Cook until they are soft and wilted. Add your thyme marjoram and cayenne pepper, stir to combine. Pour in your broth and add your potatoes. Cover and simmer until the potatoes are tender. This can take anywhere from 15-30 minutes. Check for doneness by piercing a potato with a sharp knife. If it goes in easily, they are done. Scoop the soup into a blender and puree until smooth. (be sure not to blend too much soup at once and put a towel over the lid when you are blending so the hot soup doesn’t explode out) Add the pureed soup to a large bowl. Continue blending the whole pot of soup in batches, until it has all been blended. Add the soup back to your pot, season with salt and freshly ground black pepper to taste. Top each bowl with a few sprinkles of freshly chopped thyme. * a quick note on cleaning leeks: leeks tend to have a lot of dirt and grit in them. If you aren’t careful when cleaning them, you may think they are totally clean, start cooking with them and find your entire dish has a nasty grittiness to it. This can ruin a dish 😦 After trimming off the ends (called the beards) and the dark green tops (save these for stocks). You can run them under cold water at this point, or even better, you can submerge the leeks in a large pot of cold water. Swirl them around to really remove all the grit and dirt. Drain well and then cut. I am obviously on a pumpkin kick right now, so I am playing around with all kinds of pumpkin recipes. Since I had baked the beautiful sugar pumpkin to make homemade fresh pumpkin puree a few days prior, I had muffins on my mind. I also wanted to experiment with making up my own recipe, since I had really never done so with baking. Playing around with flours and measurements when it concerns baking, frankly intimidates me. I am always worried that with one little misstep, an entire recipe can be ruined. With all the baking I have been doing in the last few months, I felt like I knew enough about what flours I liked and what they needed to be paired with, to attempt to create my own combination. I am happy to report that my first attempt at making my own recipe, was a success! These muffins are perfectly moist and fluffy and have so much pumpkin flavor. I decided to add in some chopped hazelnuts and dried cranberries that I had in the pantry, please feel free to omit these, or try out other nuts, fruits or even chocolate chips. Experiment and have fun. I am finally loving baking, which is something I have always longed to enjoy. Looking to make these vegan? Instead of two eggs, use 1 tablespoon Ener-G Egg Replacer whisked with 1/4 cup warm water and use almond or soy milk in place of the milk. Preheat oven to 375º F. Line a standard muffin tin with paper liners. Mix dry ingredients (the first 11 ingredients) together in a large mixing bowl. In another bowl, whisk together your eggs, pumpkin, olive oil, milk, vanilla and lemon juice. Add the wet ingredients to the dry. Mix the batter thoroughly, either with your stand mixer or by hand, to combine all the ingredients, mix until smooth. Stir in the hazelnuts and dried cranberries by hand, mix until incorporated. Divide the batter evenly among the muffin cups. Bake in the center of a preheated oven for 20 to 25 minutes, until golden and firm to the touch. A wooden pick inserted into the center should emerge clean. Cool the muffin pan on a wire rack for five minutes. Gently pop the muffins out to continue cooling on the rack (don’t cool them longer than 5 minutes in the hot pan- they’ll definitely get soggy). 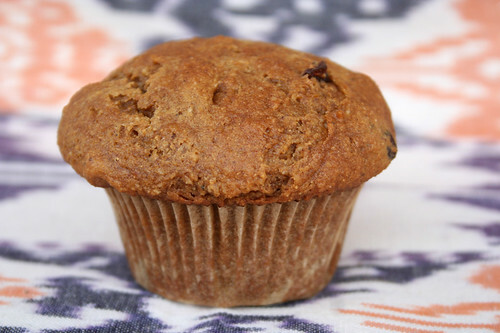 Enjoy a muffin after they have cooled 10 minutes. Freeze any leftover muffins in tightly sealed freezer bags and pop one out for a quick and easy breakfast. If you are baking a pumpkin to use in a variety of different recipes, do yourself a favor and do not throw away the seeds. They can be used in so many different recipes and they are a perfect Fall snack just on their own. Toasted pumpkin seeds have a beautiful nutty flavor and they are great on salads, you can make pesto with them and so much more. Feel free to experiment with spices to flavor the seeds either savory or sweet. Preheat oven to 400°F. 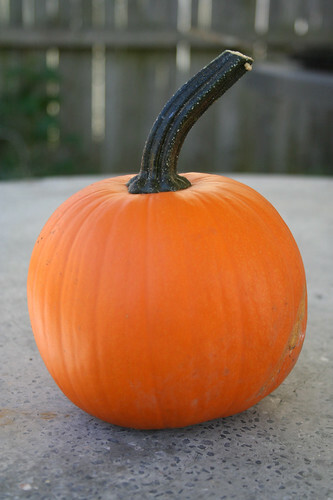 Cut your pumpkin in half and remove the seeds and the stringy pulp. Rinse pumpkin seeds under cold water and pick out the pulp and strings. Spread the seeds out over a cookie sheet, all in one layer. 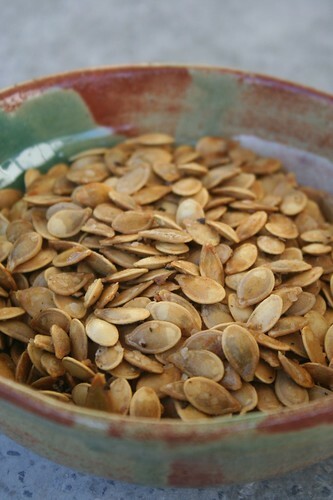 Drizzle the pumpkin seeds with a tablespoon or two (depending on how many seeds you have) of olive oil or melted butter. Toss to combine. Sprinkle with kosher salt, freshly ground black pepper and any other spices you may be using. Bake until the seeds begin to brown and get crisp, 10-20 minutes. When browned to your satisfaction, remove from the oven and let the pan cool on a rack. Store in an air-tight container. Ever since I got my ice cream maker, I’ve been wanting to try my hand at making a vegan ice cream. This ice cream is so creamy you would never ever know it is dairy free. Mark didn’t believe me. I liked it better than most ice creams I have ever had, because it was a bit lighter and didn’t give my stomach that heavy feeling after I ate it, like many ice creams can. I also really loved how easy this was to make. Basically no work at all. A lot of people are hesitant to bake and cook with coconut milk for fear the coconut flavor will outshine the other ingredients. There is relatively no coconut flavor from the milk, so it doesn’t over power the taste of the pumpkin or the spices. Each spoonful of this ice cream actually tastes just like a perfect bite of crustless pumpkin pie with a dollop of whipped cream on top. I can’t recommend enough using fresh pumpkin puree if you can. If you can’t some good quality canned organic pumpkin puree will do. Combine all of the ingredients together in a large bowl and whisk to combine well. Let chill for about an hour in your fridge. Once it is thoroughly chilled, follow instructions for your ice cream maker. Skip the canned junk. How to make your own pumpkin puree. The processed goop in a can, doesn’t even begin to compare to using fresh pumpkin in recipes. The taste is so much richer and it is so much better for you. Pumpkins are loaded with vitamins and nutrients. Making your own pumpkin puree is easier than you think and once you do it, you’ll probably never use the canned junk again. I picked up two decent sized sugar pumpkins at the farmers market this weekend. Each pumpkin was just $2 each and together they will probably yield at least 4 cups of pumpkin puree, if not more. You can even use the pumpkin from the jack-o-lantern that you carved up, but the sugar (or pie) pumpkins are just a bit sweeter and more tender. If you do use your jack-o-latern pumpkin, be sure to increase the spices a bit more as they can tend to be a bit bland. Pumpkin puree is great for pies, muffins, bread, ice cream, the list goes on and on. 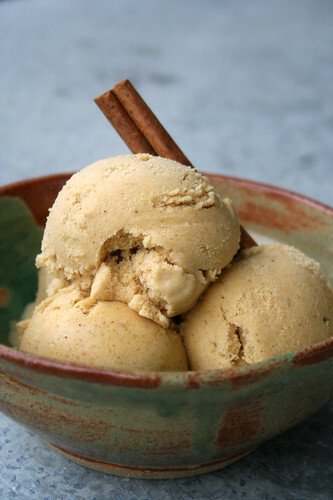 From one pumpkin I was able to make vegan pumpkin spice ice cream, pumpkin spice muffins and I still had some leftover that I just added some brown sugar, butter, hazelnuts and some spices for a little lunch side-dish, which I am eating as I type this. Another great thing about baking your own pumpkin, are the seeds. Save those seeds and then toast them with a bit of olive oil and salt. They are great as a snack, on salads, or you can even make a great fall pesto with them. (that’s on the agenda for this week). Cut the pumpkin in half and clean out the seeds and stringy membrane. 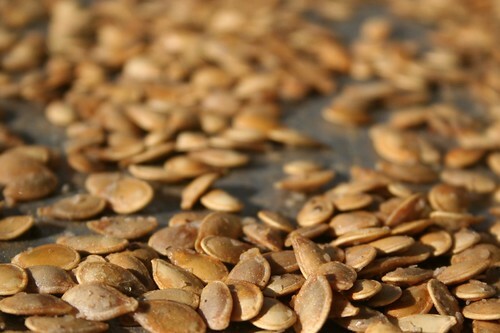 Reserve seeds to make toasted pumpkin seeds. lace the pieces cut side down in a roasting pan along with 1/2 inch of water. Cook for 45 minutes to an hour, until the pumpkin is soft. You can check for doneness by piercing a fork into the flesh of the pumpkin. Remove from the oven and allow to cool. Scoop the flesh away from the skin. Blend the flesh in your food processor until smooth like canned pumpkin. The pureed pumpkin can be used right away in recipes or you can store it a day or two in the refrigerator in an air-tight container. If it is going to be more than a couple days until you will be using it, freeze it in small quantities in freezer safe bags. I had a beautiful acorn squash that I needed to use before it turned and I had been dreaming up a delicious vegan stuffed dish. The smells alone from this were incredible and the flavors couldn’t have been more perfect together. I have to admit, I think I am most obsessed with Autumn and all of the foods associated with it. Even though produce is becoming a bit limited, there is something about experimenting and trying out new recipes with all of the wonderful ingredients that are in season. Each season, I make an effort to try at least one new seasonal ingredient that I have never cooked with. So far for this season it’s delicata squash, I picked one up this week and I am still trying to figure out what I would like to make with it. Got any suggestions? What new seasonal ingredient are you going to try for the first time this Autumn? This dish had so much flavor, the crunch from the nuts with the creamy squash and the nutty sweetness from the rice were all absolutely made for each other. I had been thinking about adding kale for color and extra nutrients, but honestly forgot until I pulled it out to serve it. Next time. Other great additions to the stuffing would be dried cranberries or even apples. You could also use walnuts or pecans instead of hazelnuts. I love all the variations and improvisations you can take with cooking, you can really make a dish unique every time you make it. Have fun. Preheat oven to 375°F. Cut each Squash in half crosswise. Scoop out and discard the seeds and strings. Place on rimmed baking sheet or in baking pan, cut side up. Sprinkle each half with a little salt, pepper, and fresh sage. Using 1 tablespoon of olive oil, drizzle each half with the oil. Cover the pan with foil and bake the squash just until moist and a bit tender, about 30-45 minutes. Meanwhile, cook your rice according to the package directions. In a saute pan, heat your olive oil over medium to high heat. Add your tofu and fry until brown and your desired amount of crispiness is received. When done remove to a paper towel line plate. Reduce the heat to medium, add more olive oil if needed, add chopped onion and saute for 2-3 minutes until it begins to soften, add garlic and saute another 3 minutes until both are soft but before they begin to brown. Remove from heat. In a large bowl, combine cooked rice, tofu, sautéed onions and garlic, fresh sage, and the toasted walnuts. When the squash is done, remove from the oven and spoon out some of the cooked squash to the bowl with the rest of your ingredients. 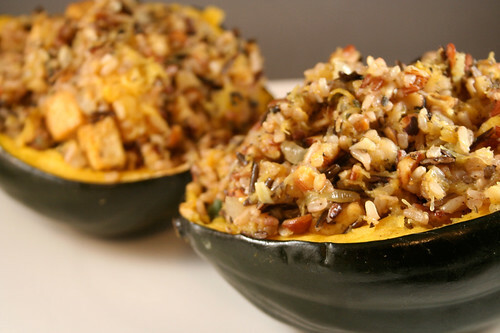 Be sure to only scrape a little, you will want to leave some squash in the shells. Mix the ingredients together, salt and pepper to taste. Press the rice mixture into the squash halves, dividing it evenly. You can round the stuffing above the rim of the squash shell. You may have rice mixture left over depending on how big your squash is. It is a great side dish on its own. Cover with aluminum foil and bake for 20-30 minutes or until the squash flesh is thoroughly tender and it is warm throughout. *To press tofu, drain the water from the package and lightly squeeze the tofu between paper towels to remove excess moisture.